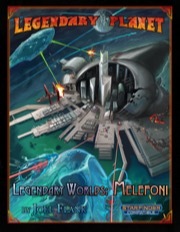 On the ocean planet of Melefoni, the intrepid colonists of the Trailblazer have built a home amid the ruins of their fallen colony ship. The dwellers in the deep oceans below face ruin of their own as the shattered drive core poisons their homes in the pelagic depths, leading to all-out war above and below the sea against the invaders from beyond. New feats, spells, and gear to help you survive this war-torn water-world await, along with a detailed planetary gazetteer, adventure hooks, and brand-new monsters, including three varieties of the sonic warrior asquenti! and the half-breed benthonir, along with statistics for both as playable races! Woohoo! A water-world of adventure is yours, IF YOU DARE! Print version sent back with Paizo from PaizoCon, so will be available in print and print/PDF bundles as soon as it gets unpacked!